I hate shopping, that is known. But there are a few things that I actually like shopping for–one of them is scarves. I looooove scarves because you can add it into any outfit (provided that you’re in a climate that allows for scarves) in many ways (provided that you’re in a climate that allows for those ways). There’s a blog post about over 50 ways to tie a scarf, and you can still make up your own. We were in China for the start of autumn, so it was fun to play around with layering and scarf styling. In one day alone, I used three of the really, really basic ways, but you can see how my look immediately changes without actually changing outfits. People’s Garden, one end of Nanjing East Pedestrian Road, and the other end of Nanjing East. (1) Oomph on standby: If you’re not using the scarf yet, you can use it as a bag accessory instead of keeping it hidden. This also frees your bag space for your stuff. (2) The European loop: Fold it in half, and drape around your neck with the looped end on one shoulder, then pull the long end through the loop and tighten as desired. (3) Classic drape: If you need only a little bit of warmth behind your neck, just drape it around your neck. Easy peasy. To be honest, these photos weren’t originally for this blog; I was just doing a tourist-y thing and having my photo taken with the city scenes. It was only afterwards, when we were reviewing photos, when I realized that I had somewhat unintentionally demonstrated a few of the ways to wear a scarf. Haha! 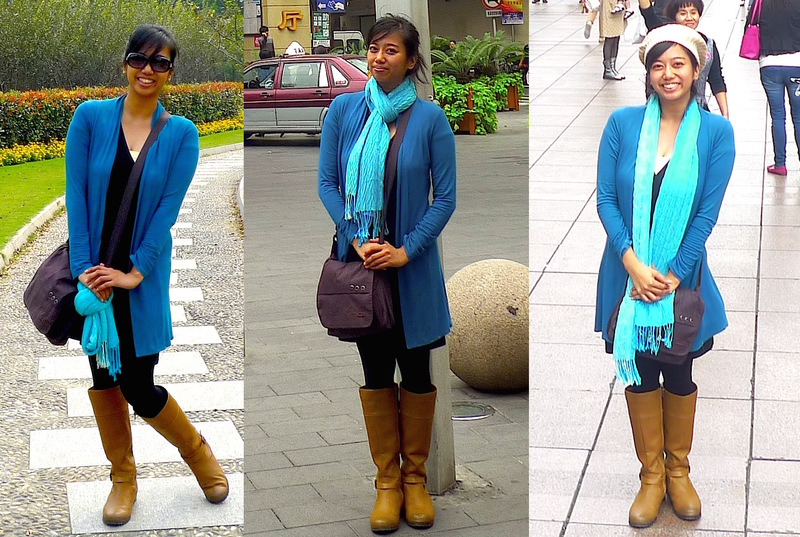 For this outfit, I was wearing: my blue ombre scarf from Canada, a teal cardigan from DEI, Charles & Keith tall boots, a basic little black dress from a tiangge somewhere, opaque black stockings from a department store somewhere, a skin tone bandeau. My bag is the freeie from Metrobank, my shades are from Fly, and my beret is from a bangketa in Baguio. Title from “Three is a Magic Number” from Schoolhouse Rock.